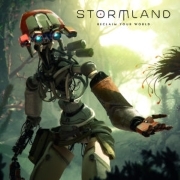 Stormland is an upcoming open-world adventure game designed exclusively for the Oculus Rift. Because it's a VR enabled game, you can expect the minimum GPU requirements to be around a GeForce GTX 970 or Radeon R9 290, perhaps even higher. Begin your adventure as a shattered android who must now seek to repair itself in an ever-changing cloudscape. Continue to augment your newly repaired body as you seek out new friends to join you on your quest. Explore alone or team up with a friend online - it's time to reclaim your world.